Rejoice, Honda and McLaren fans everywhere! The company's planned return to Formula One is real, and it's spectacular. This curvy, shiny mass of carbon fiber, aluminum, and other spaceship-grade materials is the company's first official photo of its new F1 engine. Why are we saying "maybe," then? Well, it's because Mercedes' photos last year were a bit off from the actual production engine, as were Ferrari's and Renault's. Mercedes' press photos, for example, showed a non-split turbo instead of the innovative split turbos they used in the real cars. Some rumors point to Honda being a tad behind in development, redesigning many components in light of the Mercedes-powered cars' breakaway success this year. Either way, Honda's official release of information about the engine design is a good sign that it's on its way to production. Honda plans to test its powerplant at Abu Dhabi after the final race of the 2014 season. The kinetic energy recovery system is a evolution of on KERS (Kinetic Energy Recovery System), the system used in F1 racing from 2009 to 2013, and works similarly to the hybrid system for the Accord Hybrid and Fit Hybrid, by using a motor and electrical generator to convert kinetic energy into electrical energy. With an engine-powered car, kinetic energy through braking is lost into as it becomes thermal energy through the brake units. In other words, energy is lost through braking. With a hybrid system, this lost energy is recovered by the motor/generator unit as electrical energy, and is stored in the battery, which can then be used to power the motor during acceleration. The kinetic energy recovery system's motor/generator unit is called "MGU-K" (Motor Generator Unit - Kinetic). The second system, the thermal energy recovery system, captures the thermal energy generated from the engine's exhaust. Hot exhaust from the engine's combustion chamber is normally lost via the exhaust pipes. The thermal energy recovery system, a motor/generator unit, reuses this thermal energy to generate electricity. This unit is called "MGU-H" (Motor Generator Unit - Heat). The release of this new V6 turbo power unit comes ahead of this weekend's Suzuka Grand Prix and is bound to be a hit both at home as well as with Honda fans everywhere. Honda Racing is BACK! Honda released a sound clip of the new engine last year, but this is the first time a (supposed; let's not forget this is the hyper-secretive world of F1) photo of the power unit has been released. 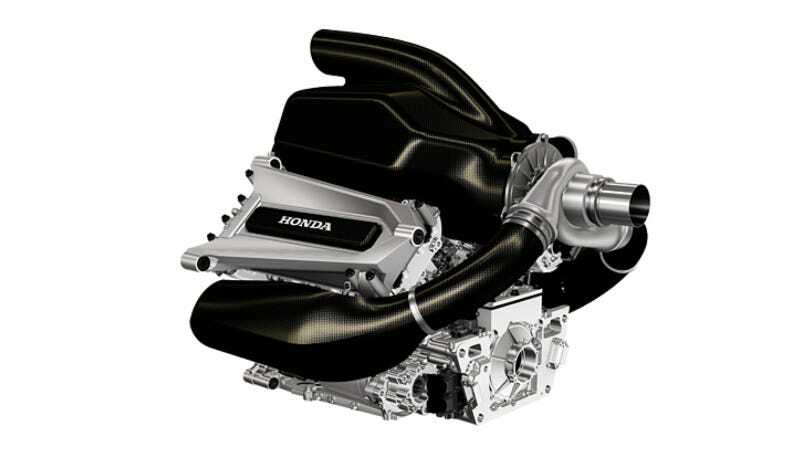 Basic technical stats and explanations can be found on Honda's site for the power unit. The illustrations feature a conventional turbo layout, unlike Mercedes' successful split turbo unit. As for the other teams, there is still an engine design freeze in place—sort of. It gets complicated, because F1. There are 31 items that now can be changed on the existing Mercedes, Renault and Ferrari engines outside of the upper and lower crankcase, the crankshaft and air valve system. In other words, this is certainly an interesting time to get a new engine supplier in F1.